* Using a Keyed Collection (PRIM_KCOL) as a simple array. * Define the keyed collection to be used to store employee names. * The collection is named #Employee and it collects #FullNames. * It is indexed (or more correctly, keyed by) #Std_Num ie: a packed (7,0) number. * #FULLNAME allows employee names to be input. 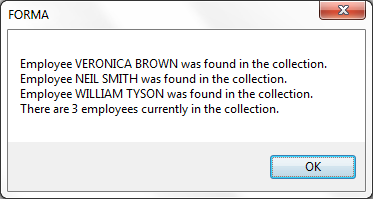 * Button #PHBN_SAVE saves employee names into the collection. * Button #PHBN_SHOW shows the details of all the employees in the collection. * Save the employee's full name into the keyed collection in the next slot. * collection as an object by using a for / end for loop.